My first encounter with chorizo was when one of my housemates would scramble up some eggs with it back in Austin. It was greasy and it smelled funny to me, and I wanted nothing to do with it. Much like a different housemate who brought home some squid and, not having the least idea how to prepare it, scrambled it up with some eggs. I don't really remember a taste so much as little strips of rubber that, no matter how much I chewed, refused to go away. I'm sure it will come as no surprise that I was in no hurry to experience either chorizo or squid ever again. When I moved to Chicago, I encountered squid fairly quickly on the menu of almost every Italian restaurant, cleverly disguised as calamari, but I wasn't going to fall for that. And then I was dining with someone who ordered it and convinced me to take a taste. So I took the teeniest, tiniest little fried ring I could find and drowned it in the marinara with which it had been served. And then I took another, bigger, ring and only dipped it in the sauce. And then I asked my dining companion what he was going to have for his appetizer. Just kidding, but it was that good. So I started thinking about chorizo, and I began to wonder if maybe it was the preparation that made it so unpalatable to me. I had run across references to it over the years, in recipes and online discussions, and I began to think maybe I should give it a try. So I decided to pick up a package the next time I was at Treasure Island. I wasn't completely sure how I was going to prepare it, so I wandered over to the produce department to see if I could find some inspiration there. 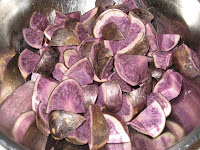 As luck would have it, I saw some beautiful purple potatoes, not something I see every day. I know potatoes and sausage go well together, so I decided to go with that. I thought it might make a good accompaniment for my corn casserole. I thought it would go faster if I roasted the potatoes first, rather than cooking them in the skillet with the onions and chorizo. I washed and quartered them, but did not peel them. You can see how pretty they are inside Unfortunately, they just turn brown when they are cooked and aren't so pretty. I tossed them in a bowl with olive oil, salt, pepper, cumin and a little chili powder. I roasted them in a 350 degree (F) oven for about 20 minutes, until they were tender, but not too soft. I knew they were going to cook some more in the skillet and I didn't want them to fall apart on me. The chorizo came in a plastic-wrapped tube. I split it open and squeezed the sausage out into my heated cast-iron skillet. I knew it would be greasy so I did not add any oil to the pan before I started heating it. 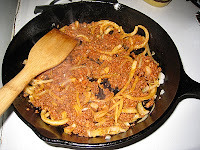 I mashed it around with the wooden spoon until it broke down like ground meat, and then I added the onion. Chorizo already has garlic so I did not add any more, just the sausage and onion. No salt or pepper, either. I let the onion and sausage cook until the sausage was thoroughly browned and the onions were nice and translucent. 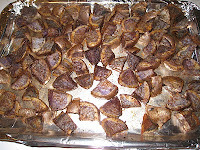 I added the potatoes at the end and left them in just long enough for them to get coated and to be completely heated. They were good on their own, and they nicely complemented the corn casserole. 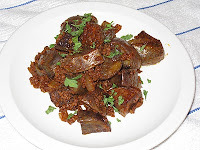 I will definitely experiment with chorizo again. 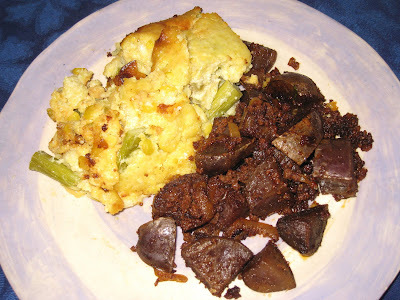 And I have since discovered that they are supposed to be good with scrambled eggs, so I believe I might just have to try that myself, now that I know how the sausage is supposed to be cooked.